The last will and testament of Courtney Goffney. On 12 October 1914, Dr. William A. Mitchner tendered to the Clerk of Wilson County Superior Court a document purporting to be the last will and testament of Courtney Goffney. Satisfied that the document was authentic, the clerk entered the will into probate. Goffney’s wishes were simple: (1) erect a suitable marble or granite headstone over the graves of her and her husband William “Billie” Goffney and (2) give all her property, real and personal, to her beloved nephew Sylvester Goffney. In the 1870 census of Swift Creek township, Edgecombe County, North Carolina: farm laborer Spencer Battle, 55; wife Eda, 49; and Constance, 26, Annie, 7, Mende, 2, Ovia, 24, Corteney, 19, Paul, 16, and George Battle, 14. On 29 December 1881, William Goffney, 30, married Cortney Battle, 27, in Edgecombe County. In the 1900 census of Wilson, Wilson County: teamster William Gwaltney [Goffney], 56; wife Courtney, 50; step-son John Bunn, 25, blacksmith; and nephew Sylvester Gwaltney, 6. In the 1910 census of Wilson, Wilson County: on Stantonsburg Street, widow Courtney Goffney, 50; Ada Battle, 30(? ), graded school teacher; and lodger Sylvester Goffney, 16, factory laborer. Courtney Goffney died 9 October 1914 in Wilson. Per her death certificate, she was born 2 September 1845 to Spencer and Edia Battle and was a widow. Informant was Constance Battle, Rocky Mount, N.C. Images of estate documents available at North Carolina Wills and Estates, 1665-1998 [database on-line], http://www.ancestry.com. He went to Wilson and hasn’t been heard from since. Wilson Advance, 18 January 1894. Old Sparta was a community in southeast Edgecombe County between Pinetops and Conetoe. Studio shots, no. 89: the Mobley family. I posted the obituary of Jane Rountree Mobley here. Her great-great-granddaughter, Carolyn Maye, has graciously shared these photographs of Jane Mobley’s descendants, many of whom moved into Edgecombe and Pitt Counties in the early years of the 20th century. In the 1880 census of Wilson, Wilson County: farm worker John Mobley, 35; wife Jane, 28; and children Rhoda, 9, Henrietta, 6, Jane, 5, Isaac, 4, and John H., 1. On 13 January 1889, Ben Barnes, 42, of Wilson township, married Rhoda Mobley, 21, of Toisnot township, on F.A. Woodard’s plantation in Wilson township. Primitive Baptist minister Samuel Burston performed the ceremony in the presence of Harry Sharp, Dennis Bynum and Mike Barefoot. Rhoda Barnes died 1 June 1951 in Macclesfield, Edgecombe County. Per her death certificate, she was born 1 October 1854 [actually, about 20 years later] in Wilson County to John Mobley and Jane [maiden name unknown]; was a widow; and was buried in Harrell cemetery near Crisp, North Carolina. Mattie Howard was informant. Ben Barnes died 19 April 1935 on Amanda Pitts’ farm in Edgecombe County. Per his death certificate, he was born 12 December 1835 in Wilson County to Isaac Barnes and Julia [maiden name not given]; was married to Rhoda Barnes; was buried at Harrell cemetery. Informant was Jessie Barnes. 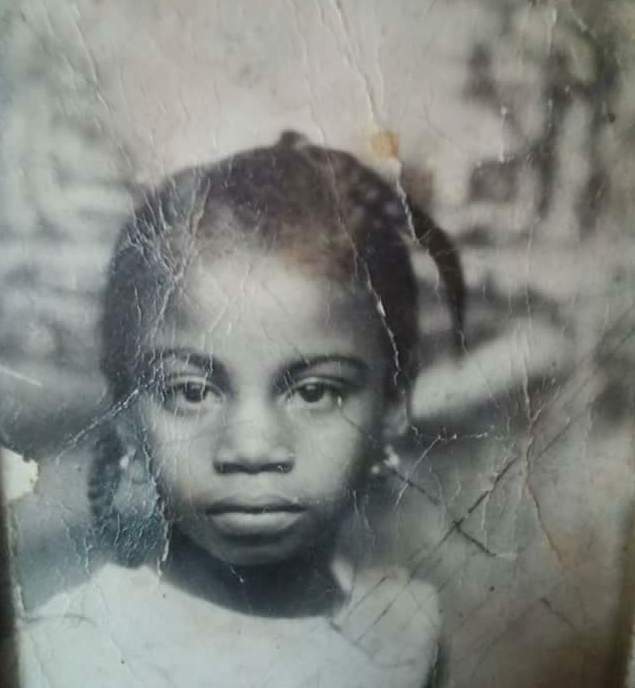 Martha Lee Roberson Maye (1932-2014), daughter of Willie and Annie Barnes Roberson, at age 7 and shortly before her death. Mattie Barnes Howard (1905-1977), daughter of Rhoda and Ben Barnes. Studio shots, no. 85: John and Margaret Lewis Maryland. In the 1880 census of Rocky Mount, Edgecombe County: farmer John Maryland, 58, born in Maryland; wife Melvel, 40; and children Haywood, 17, who was deaf; Schofield, 16; Walter, 10; Mary, 9; John, 7; Hattie, 6; Primas, 4; and Jonas, 2. In the 1880 census of Upper Town Creek, Edgecombe County: farmer Handy Lewis, 38; wife Jane, 40; children Wash, 16, Joshua, 12, Margarette, 8, Caroline, 6, Tiney, 4, and Robert, 2; and step-daughter Nicey, 16. John Maryland, 21, of Nash County, married Margaret Lewis, 19, of Edgecombe County, daughter of Handy Lewis, on 8 April 1894 in Edgecombe County. Haywood Maryland applied for the license. In the 1910 census of Toisnot township, Wilson County: John Maryland, 40, farmer; wife Margaret, 30; children Cora, 15, Mandonia, 15, Robert, 13, Della, 10, Charlie, 6, Richard, 4, Percy, 2, and William T., 1 month. William Maryland died 19 September 1919 in Toisnot township, Wilson County. Per his death certificate, he was 23 years old; a farmer; married; born in Wilson County to John Maryland and Maggie Lewis; and buried in Nash County. In the 1920 census of Toisnot township, Wilson County: farmer John Maryland, 50; wife Margritt, 40; children Robert, 24, Della, 22, Charley, 18, Richard, 16, John P., 14, William, 13, and Primas, 11; nephew Walter, 14, and niece Hellen, 12; daughter-in-law Ether, 19; and grandchildren Maggie, 7, and Cuba, 2 months. In the 1930 census of Toisnot township, Wilson County: on Rocky Mount-Town Creek Road, John Maryland, 58, farm laborer; wife Maggie, 49; son Richard R., 23, farm laborer; daughter-in-law Mamie, 23; and grandchildren Daisy L., 6, and Willie C. Maryland, 4. In the 1940 census of Toisnot township, Wilson County: farmer John Maryland, 67; wife Maggie, 65; and grandchildren John, 17, and Martha Maryland, 12. Per his grave marker, John Maryland died 23 June 1947. Maggie Margaret Maryland died 27 February 1965 in Sharpsburg, WIlson County. 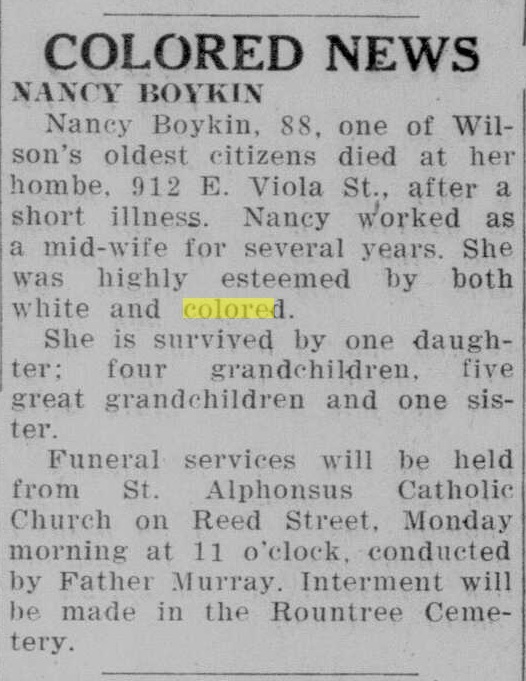 Per her death certificate, she was born 3 September 1885 in Nash County to Handy Lewis; was a widow; and was buried in Wesley Williams cemetery. Robert Maryland, Sharpsburg, was informant. Robert Maryland died 14 October 1971 in Rocky Mount, Edgecombe County. Per his death certificate, he was born 4 July 1903 to John Maryland; was married to Estella Bunn; lived at 720 Brooks, Rocky Mount; and was a retired janitor at Morgan Motel. Willie Lee Maryland was informant. Photographs courtesy of Ancestry.com user ElijahDoby. Snaps, no. 37: George H. Powell. In the 1910 census of Town of Tarboro, Edgecombe County: laborer George Powell, 26; wife Mary, 25; and children Annie, 13, Viola, 6, Russel, 3, Johnny, 5, George H., 2, and Mattie, 2 months. In the 1930 census of Gardners township, Wilson County: farmer Frank Bryant, 30; wife Annie, 30; children William, 16, farm laborer, and Elizabeth, 11; and nephew George Powell, 19, farm laborer. On 24 November 1937, in Wilson, George Powell, 24, of Gardners, son of George Powell and Mary Jones, married Beatrice Hines, 23, of Gardners, daughter of Turner Hines and Rosa Hines. George Henry Powell registered for the World War II draft in Wilson in 1940. Per his registration card, he was born 20 October 1912 in Edgecombe County; he resided at R.F.D. 4, Wilson; his contact was wife Beatrice Powell; and he was employed by William Mack Brown, R.F.D. 4, Wilson. George Henry Powell died 22 May 1992 in Goldsboro, North Carolina. Per his death certificate, he was born 10 February 1910 in Edgecombe County to George Powell and Mary Cotton; resided at 1505 Queen Street Extension, Wilson; was married to Beatrice Hines Powell; and had worked as a carpenter. Photo courtesy of Ancestry user RogerBarron52. Wilson Daily Times, 26 July 1971. In the 1900 census of Otter Creek township, Edgecombe County: farmer Gray Read, 47; wife Lucy, 37; and children Joseph R., 18, Nancy L., 7, Elija, 5, Mart Eva, 4, Jona, 3, and Lucy, 5 months. In the 1910 census of Otter Creek township, Edgecombe County: farmer Amos Read, 64; lodger Gray Read, 57, and children Gray, 18, Eligh, 15, Margrett, 13, and John, 13. Elijah Reid, 21, of Gardners township, son of Gray Reid, married Ida Hagans, 18, of Gardners, daughter of James and Hannah Hagans, on 13 January 1915 on the Old Whitehead farm. Witnesses were Robert Hilliard, Lawrence Hagans and J.B. Owens. In the 1930 census of Wilson, Wilson County: James Hagans, 53; wife Nora, 50; sons John, 18, Joe, 18, and Laurence, 16; daughter Etta, 21; grandchildren Elizabeth, 15, Sudie M., 13, Leeoma, 10, David, 5, Bessie M., 3, Lillie M., 1, and Charlie Reid, 4; and daughter Ida Reid, 32. In the 1940 census of Wilson, Wilson County: tobacco factory laborer Elijah Reid, 49; wife Ida, 44; and children Willie, 12, Troy, 8, Sudie, 20, Naomie, 17, David, 15, Bessie, 14, Eula, 9, and Ester, 6. Naomi Reid, 21, born in Wilson to Elijah Reid and Ida Hagans, married Oliver Lee Howard, born in Wilson to Will Lucas and Lena Howard, were married 28 January 1943 in Norfolk, Virginia, where both resided. 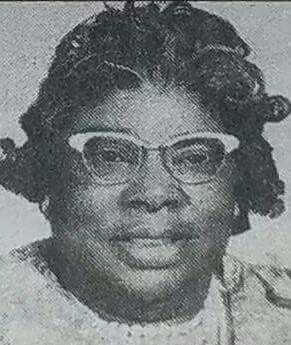 Lillie Mae Reid, 20, daughter of Eligha and Ida Reid, married William Atkinson, 26, son of Lester and Martha Moore Atkinson, on 25 February 1951 at 300 South East Street, Wilson. Witnesses were Mildred Reid, 911 Washington Street; Howard Hopkins, 703 Manchester Street; and David Reid, 300 South East STreet. Ida Hagans Reid died 29 June 1967 at her home at 300 South East Street, Wilson. 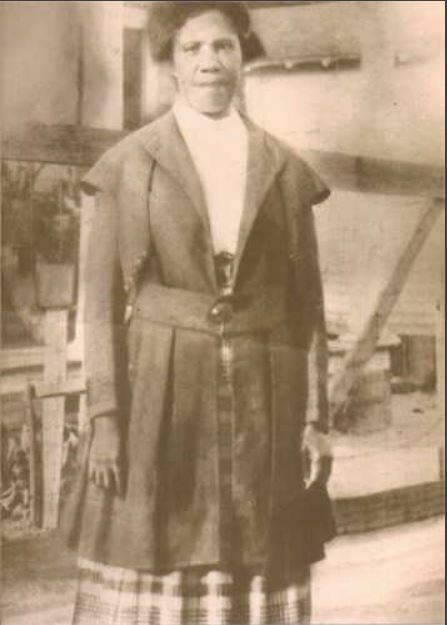 Per her death certificate, she was born 21 August 1896 in WIlson County to James Hagans and Hannah Bynum; was married to Elijah Reid; and worked as a tobacco factoryhand. Elizabeth Reid was informant. Elijah R. Reid Jr. died 26 March 1977 in Wilson. 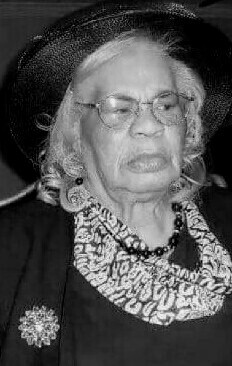 Per his death certificate, he was born 7 October 1917 in Wilson to Elijah Reid Sr. and Ida Hagans; was married to Mildred Coel; worked as a minister; and resided at 911 Washington Street. Elijah Reid Sr. died 24 August 1982 in Wilson. Per his death certificate, he was born 2 August 1894 in Edgecombe County to Gray Reid and an unknown mother; resided at 804 Hines Street, Wilson; was a widower; and worked as a self-employed repairman. Eula Wilkins of Washington, D.C., was informant. Hugh B. Johnston Jr., “Looking Backward,” Wilson Daily Times, 4 December 1954. This piece on Jordan Thomas is not entirely accurate. Franklin County native Jordan Thomas’ first wife was Charity Locus, a free woman of color. His second, Eliza, also seems to have been free. His third was Rosa Woodard, the enslaved daughter of London Woodard, who bore him a son, Peter. In the 1810 census of Franklin County, North Carolina, were free colored heads of household Lettice Thomas and Eliza Thomas. One, perhaps Eliza, may have been Jordan Thomas’s mother. Jordan Thomas married Charity Locus in 9 February 1837 in Edgecombe County, North Carolina. In the 1860 census of Gardners township, Wilson County: turpentine laborer Jordon Thomas, 50; daughters Henrietta, 21, Eliza, 20, and Harty, 18; and grandson John, 1. 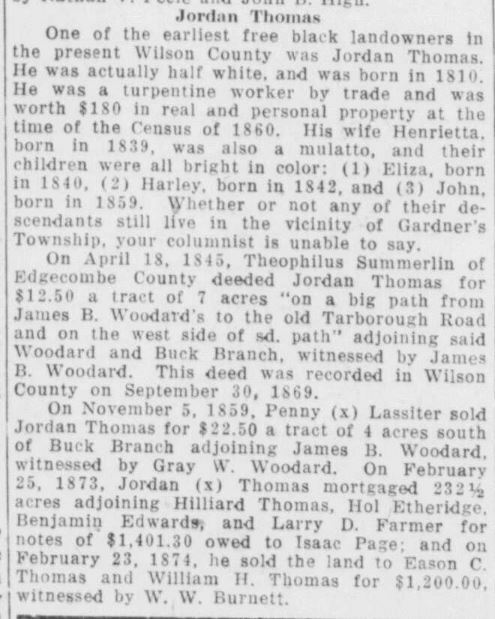 In the 1870 census of Gardners township, Wilson County; farmer Jordan Thomas, 52, who reported owning $175 in real property and $100 in personal. Next door: Eliza Thomas, 52, Henriet, 35, Hariet, 30, Alfred, 9, Jordan, 7, John, 11, Charity, 10, and Henry, 6. In the 1880 census of Gardners township, Wilson County: farmer Jordan Thomas, 68; daughters Henyeter, 42, and Harty, 40; and grandchildren John, 21, Charity, 18, Henry, 15, Jordan, 17, and Alfread, 18. On 5 July 1899, Jordan Thomas made his mark on his last will and testament. Under its terms, “beloved daughters” Harty and Henretta Thomas received a life interest in the 11 acres upon which he lived in Gardners township adjoining the lands of Benjamin Finch, Benjamin Artis and T.W Barnes. After their deaths, the property was to go to grandchildren Jordan Thomas, Alfred Thomas and Charity Hagans. The will entered probate on 21 March 1901 in Wilson, presumably shortly after Thomas’ death. In the 1900 census of Gardners township, Wilson County: farmer Jordan Thomas, 88, widower, and daughters Henrietta, 60, and Adline, 57. Peter Thomas died 7 July 1929 in Wilson township. Per his death certificate, he was 78 years old; married to Maggie Thomas; was a farmer; was born in Wilson County to Jordan Thomas and Rosa Thomas; and was buried in Penders family cemetery, Wilson County. Sudie Barnes was informant. On 19 December 1932, Jordon Thomas died in Toisnot township, Wilson County. Per his death certificate, he was about 70 years old; was born in Wilson County to Henrietta Thomas; and was a farmer. Informant was J.T. Barnes. 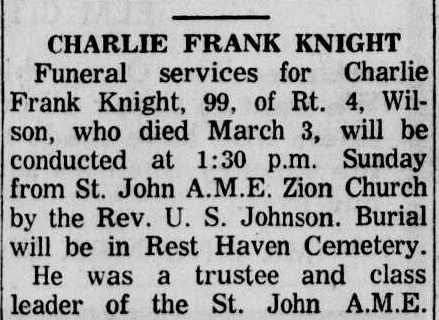 Obituary of Charlie F. Knight. Wilson Daily Times, 5 March 1963. On 12 February 1905, Charlie Knight, 30, son of Louis and H. Knight, married Annie Pool, 15, daughter of Dempsy and Gracie Pool. Missionary Baptist minister Jeremiah Scarboro performed the ceremony “on the Old Bass Plantation” in the presence of Mack Simms, Jonah Lipscomb, and Willie (or Millie) Ellis. In the 1910 census of Wilson township, Wilson County: on County Line Road, farmer Charlie Knight, 31; wife Annie, 27; son William Poole, 7; and sister-in-law Mahala Poole, 15. Charlie had been married twice. Charley Frank Knight registered for the World War I draft in Wilson County in 1918. Per his registration card, he was born 31 October 1872; resided at Route 3, Wilson; worked as a farm laborer on J.C. Eagles’ farm; and his nearest relative was wife Annie Knight. He signed his full name: Charlie Frank Knight. In the 1920 census of Taylor township, Wilson County: farmer Charlie Knight, 40; wife Annie, 33; son William, 16; widowed laborers Mattie, 40, and Anna Knight, 60; and nieces and nephews Aulander, 16, Charlie, 13, Cleora, 11, Sarah, 9, Mary, 3, and Mary Knight, 3. In the 1940 census of Taylor township, Wilson County: farmer Charlie Knight, 65; wife Annie, 50; and sons Stephen, 12, and David, 11. Charlie Frank Knight died 3 March 1963. Per his death certificate, he was born October 1885 in Edgecombe County to Louis Knight and Mahalie [last name unknown]; was a laborer; and was buried in Rest Haven cemetery. Informant was Annie Knight. Pittsburgh Courier, 12 February 1944. This second obituary of Susan Pyatt, mother of Hannah Pyatt Peacock, made special mention of her role in organizing Pyatt’s Chapel A.M.E. Zion, just inside Edgecombe County. The congregation still meets in a tiny edifice on Temperance Hall Road, a few miles east of Elm City. Photograph courtesy of Google Map.